This One Pot Low Carb Paleo Keto Asian Chicken Stir Fry (with pea shoot “noodles”) is a recipe I could get used to eating a lot more often! Now- if you’re new to a paleo or keto diet, you might be aware that soy (and soy sauce) is a big old fat no-no. While some of the science on this is a bit controversial (I am in no way, shape, or form a doctor or dietician – I am following guidance in picking a low carb diet from my doctor and consult with them, as anyone should – this is not medical advice and should not be followed as such in any way), soy is usually avoided on many low carb diets thanks to the potential for increased inflammation. As someone who loves stir frys, lo mein, teriyaki dishes, and could basically drink soy sauce out of the bottle, this was huge for me until I found a delicious, easy, and simple soy sauce alternative – coconut aminos! This simple Asian Chicken Stir Fry is bursting with flavor, and is naturally lower sodium, lower carb, gluten free, and soy-free compared to recipes made with soy sauce or other asian-inspired sauces. It takes only one pan, and less than 20 minutes for a stir fry you will want to eat again and again, no matter if you’re on a low carb diet or not! 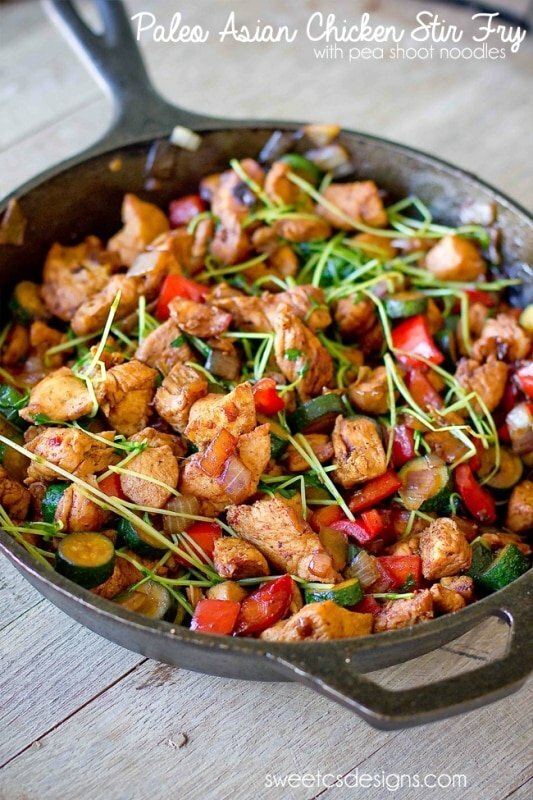 just take me to the paleo asian chicken stir fry recipe already! 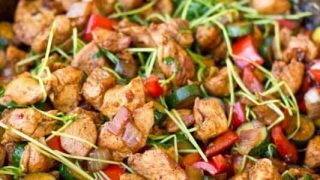 If you’d rather skip my (very helpful, i think) tips and tricks, essential cooking info, and similar recipe ideas – and get straight to this deliciously easy keto and paleo asian chicken stir fry recipe, simply scroll to the bottom of the page where you can find the printable recipe card. You might be wondering how I made the switch off soy – but still enjoy Asian-Inspired dishes with a soy sauce flavor – with a soy free soy sauce. A couple of years ago, I found Coconut Aminos in a health food store – and since then, they have been my go-to for soy free soy sauce replacement ever since! Coconut aminos are a great marinade, sauce for stir frys, and flavoring agent just like soy sauce – making coconut aminos an easy swap. Coconut aminos are dark brown liquid that looks and tastes a lot like soy sauce. 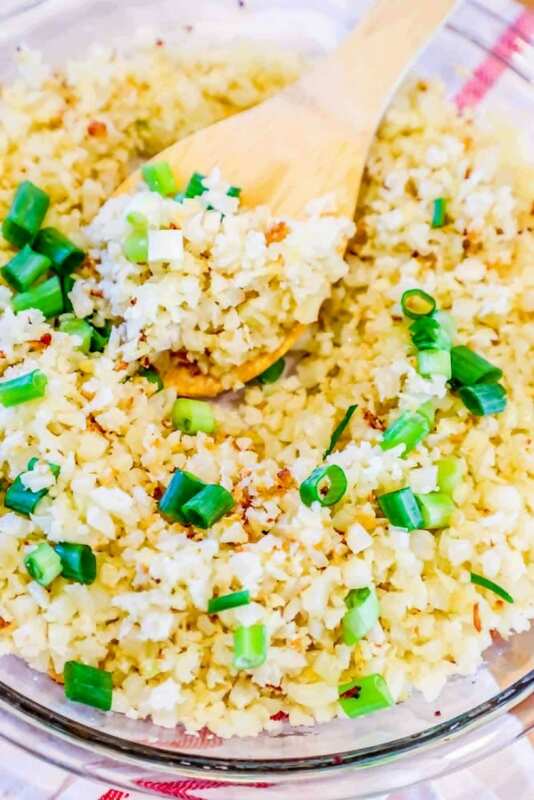 Coconut aminos are a touch sweeter than soy sauce, and a little less salty – making coconut aminos an excellent soy free soy sauce substitute for paleo or keto diet stir fry recipes. Coconut Aminos Ingredients -if you’re wondering what coconut aminos are made from, and if coconut aminos are a good low sodium or soy free soy sauce alternative, you’re in luck – coconut aminos are a very simple concoction of coconut sap and sea salt. Coconut aminos are a great soy free soy sauce alternative , and a great low sodium soy sauce alternative in a healthy eating plan. Coconut aminos are gluten free and do not generally contain any preservatives with gluten, so they are great for a celiac diet. If you really love coconut aminos, you can also find them in amazingly delicious Garlic and Teriyaki flavors too! They are all great low-sodium soy sauce alternatives – and each flavor tastes absolutely fantastic in this recipe so you could make up a big triple batch and toss each with a different flavor for meal prep that will be different each day you eat it! Coconut Aminos are a perfect substitute for soy sauce in Asian-Inspired dishes – and with the addition of Garlic and Teryaki Coconut Aminos to the Coconut Secret Brand line (this is not sponsored in any way by Coconut Secret – I just like the flavor of their coconut aminos and I’ve always been able to find their coconut aminos in our local stores.) there are SO many ways you can cook with coconut aminos! There are a couple of tips and tricks to make your coconut aminos more like the typically carb-laden American-style Asian dishes you love eating, such as chicken teriyaki, lo mein, kung pao chicken, etc. For tons of flavor without adding carbs, I like to marinate my chicken or meat in coconut aminos for rich, salty soy sauce flavor without adding soy sauce. This not only adds tons of flavor without adding carbs – it helps to keep chicken tender and juicy, too! Coconut aminos, just like soy sauce, are salty. Coconut aminos are made by a combination of coconut sap and sea salt – so it is naturally salty (though coconut aminos are less salty than soy sauce and even low sodium soy sauce – it has less sodium than both as well) – so go a bit easy on adding extra salt to your recipes when cooking with coconut aminos! You can always add a little more salt if you need to, but when coconut aminos emulsify or reduce they can add more of a salty taste, so be sure to season your meal as you cook it and taste it as you go before adding more salt. To create a well-rounded sauce when cooking with coconut aminos, I find it is best to add a bit of acid – either lemon juice or vinegar to complement the rich, salty flavor. This recipe is fabulous on it’s own (we like to eat it out of a big bowl and just dig in) but it is also especially delicious in a lettuce cup – just like these paleo steak and sriracha lettuce wraps. For a dinner party (or just a fun family dinner on a busy weeknight), serve this chicken stir fry in a large bowl on the table, and encourage everyone to make their own lettuce wrap or stir-fry bowl! I like to serve these with fresh sliced green onions, bamboo shoots, water chestnuts, chopped peanuts, or any of your other favorite asian inspired garnishes! This chicken stir fry is also excellent served with shredded cabbage and lettuce as a delicious Paleo Asian Chicken Salad, or in Asian-Inspired chicken tacos or wraps if you’re not watching carbs! This keto asian chicken stir fry is also incredible over my recipe for the Best Cauliflower Rice Ever for a delicious, hearty meal that everyone will love, low carb diet or not! 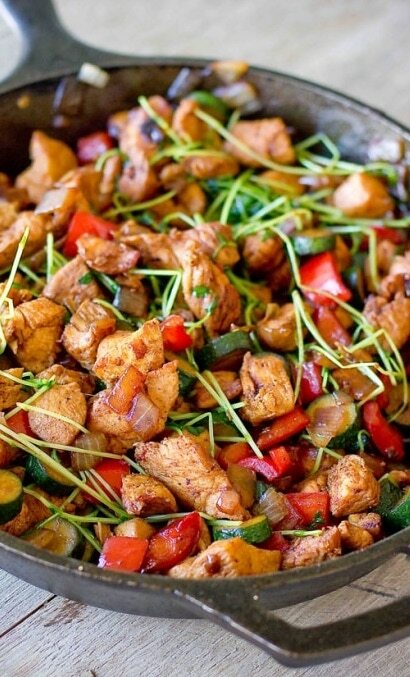 If you love this easy and delicious Keto Asian Chicken Stir Fry, you will also want to bookmark The Ultimate List of Low Carb Easy Meals For Paleo and Keto Diets. 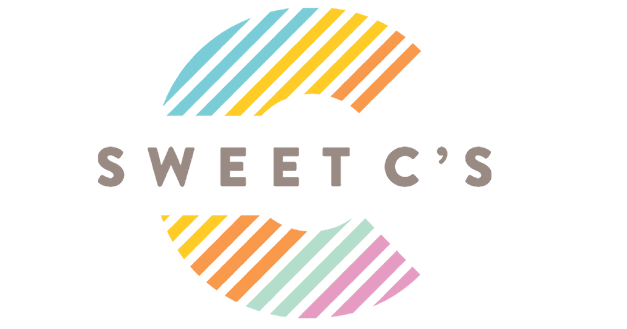 It is packed full of recipes that work in paleo, keto, Whole 30, and diabetic-friendly low carb diet eating plans. I am constantly adding more as we find new recipes that work into a low carb eating plan. 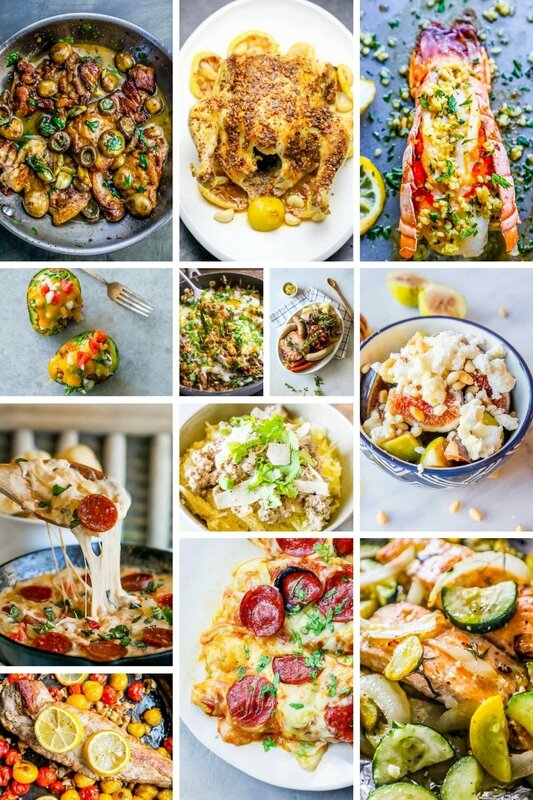 Click here for The Ultimate List of Low Carb Easy Meals For Paleo and Keto Diets. 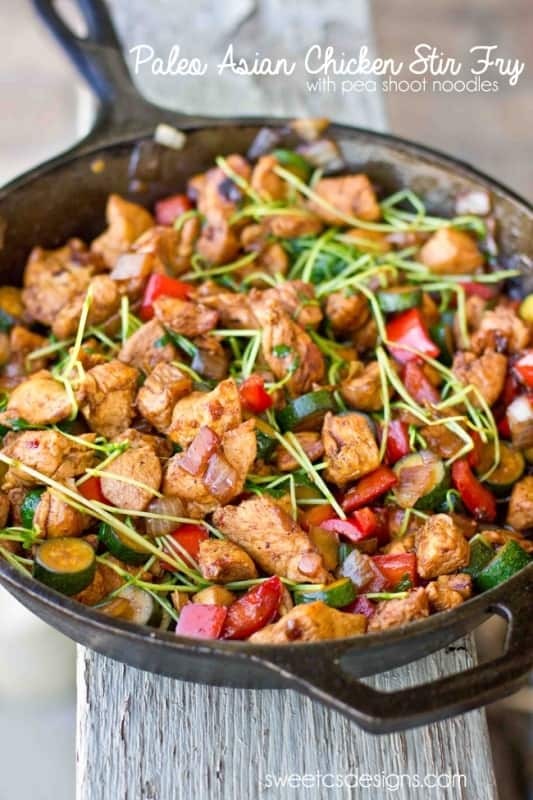 If you love this One Pot Low Carb Paleo / Keto Asian Chicken Stir Fry recipe as much as I do, please write a five star review, and be sure to help me share on facebook and pinterest! Trim excess fat or tissue from chicken and cut into 1-2" cubes. Add chicken to pan and cook 3 minutes until lightly browned, stirring occasionally to prevent burning. Stir in diced onion and garlic and stir, continue to cook until onions and garlic are soft, fragrant, and lightly browned - about another 2-3 minutes. Add in bell peppers and zucchini and cook until chicken is a lovely golden brown and vegetables are soft and browned - about 5 minutes. Stir pea shoots, coconut aminos, lemon juice, and sesame oil in and toss well over heat for 1-2 minutes - until sauce has thickened slightly and coated dish evenly. Delicious!! I paired it with cauliflower rice! 22 grams of carbs seams high for this dish. Am I missing something? Similar recipes have 6-10 carbs? I recently changed nutritional software that auto calculates – and this one didnt work well! Im slowly updating posts to fix it – sorry for the inconvenience! Great recipe! Wonderful flavors, easy and quick. Courtney, I pinned this recipe to make for dinner tonight, I bought all of the ingredients but i can’t see the actual recipe on this page anymore. Could you send it to me? I was looking forward to trying it. Thanks! Oh no! Let me look – I just changed recipe widgets and maybe it got lost? This was good, but I’d say to salt/pepper the chicken and add much more than a teaspoon of siracha. It could’ve used at least 2 tablespoons! It had almost no heat, even for my kids! The recipe was good, though! This is a very versatile recipe!! My stomach was acting up so I decided to forego any meat. I don’t like zucchini so I subbed with sweet potato. Also added fresh baby green peas since they were on hand and some organic Chinese celery to the mix. Instead of sriracha, I used a home made Thai chili sauce which did not aggravate my stomach at all. (Go figure…chicken would have bothered it but hot spicy Thai chilis don’t!) This was garnished with green onion, sesame seeds, and fresh ground black pepper! I think I’ll try this recipe with shrimp next time (not a big fan of chicken unless it’s wings or grilled thighs…I know, picky, picky, picky). Thanks for the inspiration! Recipe looks great except for the heat…..question-where do you find pea shoots? I get them at Trader Joe’s- otherwise possibly whole foods or another health food store. Try Asian markets with a good produce section. They almost always have them. Ditto! I don’t make most dishes twice (I get bored easily), but this recipe is delicious while being quick and healthy. The only addition I made was to add a bit of sesame oil to the dish before serving- I highly recommend doing so if you have it in the house. Yum, sesame oil can make a big flavor difference! !